San Francisco General Hospital and Trauma Center will get new equipment and technology and pay for the conversion of part of its current acute care center with today’s announcement of a $75 million gift to the hospital’s foundation. The gift is from Facebook CEO Mark Zuckerberg and his wife Dr. Priscilla Chan, both Bay Area residents. The gift has prompted officials with the City and County of San Francisco to start the process of naming the hospital the Priscilla and Mark Zuckerberg San Francisco General Hospital and Trauma Center. Hospital officials said the gift is the largest donation the foundation has received in its history and possibly the largest one-time gift from individuals to a U.S. public hospital. Foundation officials said the money is a vital part of what’s necessary to complete the hospital’s new acute care and trauma center, which is being rebuilt to address seismic safety concerns. The new acute care and trauma center will be built using the latest seismic safety designs. San Francisco voters approved an $887.4 million bond in 2008 to begin construction of the new hospital, and while officials called today’s gift important, more money is needed. 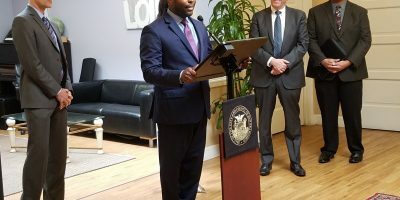 What the $75 million will do is fill up the new hospital with equipment and technology, said San Francisco Department of Public Health spokeswoman Rachael Kagan. Some of the money will go toward physiological monitors to track patient vital signs and detect whether a patient’s health is deteriorating. Some of the money will be spent on smart beds, which can provide nurses with real-time patient information, such as blood pressure and pulse rates. “It’s a tool that enhances nursing care,” Kagan said of the beds. She said patient care is really nursing care. Part of the $75 million will be spent to convert the current acute care center into an outpatient clinic building, Kagan said. Officials said they expect the new hospital to open in December. The hospital is the only one in San Francisco that provides trauma and psychiatric emergency services to city residents. It serves about 100,000 patients per year.